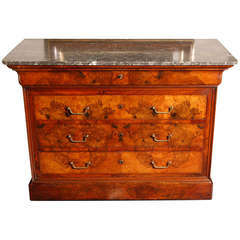 Antique Eastlake Victorian burl walnut marble-top wash stand chest with mirror. Item features beautiful wood grain, pivoting beveled glass mirror, marble top, three dovetailed drawers, and one swing door, circa mid-1800s. Measurements: 68" H x 36.5" W x 18.5" D; 28" H to marble to surface. Very good antique condition being structurally sound with age appropriate signs of normal use as pictured. Minor hole fills to marble (example image 9). Silvering wear to mirror. Overall very nice. 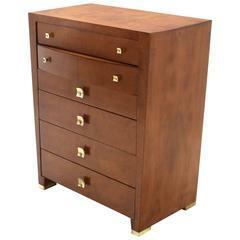 Mid-Century Modern brass pulls Art Deco high chest in burl wood walnut. 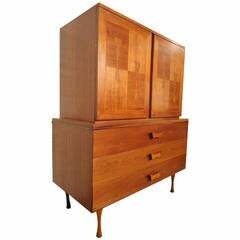 A chest of drawers in figured walnut with a grey and white marble top over a shaped frieze drawer and three drawers on a plinth base. 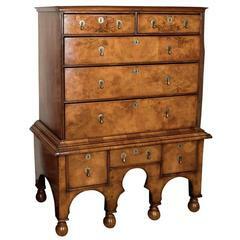 20th century Italian black lacquered chest of drawer with walnut top, 1900s. 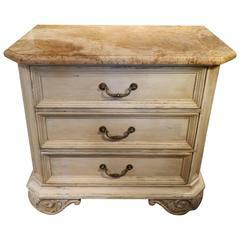 Painted three-drawer bedside chest with a marble top, 20th century.